Choose from Gingerbread, Candy Cane, French Pear, Vanilla kiss and Buttercream Vanilla. Burn time approx. 20 hours Pick up. Can deliver to Warrnambool areas some days. $7.95 standard postage I also have a face book page " pure escents" for more candle ideas and aroma beads..
Steelcraft pram for sale in warnambool. 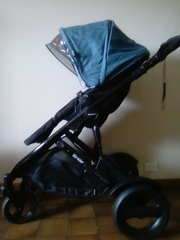 Strider compact four wheel pram for sale in warnambool. In excellent condition with accessories for baby and infant and reversible carriage so baby can face you. Retail price $689. Selling for $200.00. Delivery negotiable. PH: 0412 179 477. Nissan Pathfinder 1998 body good con full electrics duel fuel new tyres , done head gasket runs rough was driving well engine rebuilt 2years ago. Manual 5 Speed. 1.5 litre petrol Rego until 23/09/2016 No roadworthy, roadworthied only 3 months ago so wont need much. Only selling as I am moving back to Ireland. Car in good condition, lots of service history $1650 Call on 0474523391 Located in Koroit. This is a great looking watch and is easy the best-looking watch that Rip Curl ever produced. It looks like a Rolex but is cool..
Gold & Silver TISSOT watch. This is a beautiful watch and has with it an international warranty card. It has its serial number and place/date of purchase..
Large Fredrick Mccubbin framed print The pioneer 4ft.4 x 3ft.3.weighs about 6kg ready to hang on wall..
1 3 Seater Sofa Bed $595.00 1 Timber Single Bed (Custom made) $195.00 1 Timber Wine Rack $60.00 1 Large Outdoor Setting (Glass top table & eight chairs) $195.00 1 Dyson Vacuum Cleaner with Turbo Head $160.00 All in Good Condition..
Front 2.26M Side 2.26M Height 2M. Brand new (never erected) Paid $475 Sell $300. 2010 Jayco Motek, Volkswagen Chassis, Automatic transmission, Turbo diesel. This vehicle sits and sleeps 6 people! and includes some great features, Reverse Camera 4 Burner gas cooktop Oven & grill Microwave 90 Litre fridge Dual A/C Shower, toilet, vanity 2 x TV's Waeco ..
Rego until January 2017 This Audi TT is a stunning head turner. It has a powerful 3.2 litre engine and goes from 0-100 km/h in 5.7secs. Low kms on the odometer: 65465 km. BRAND NEW PIRELLI TYRES AND ORIGINAL 19" AUDI ALLOYS. This car has LED tail lamps, tachometer, driver & passenger airbags, front fog lamps, ABS brakes, cruise control and electric front seats. NEW CONDITION WITH ONLY 17, 765 KMS HSV PREM BRAKES VERY, VERY LOW KMS 17, 765 NEW CONDITION WELL LOOK AFTER, RUN AND DRIVE LIKE NEW REGO PLATES SOLD WITH CAR (CSR8) HSV SUNROOF, ONE OWNER, BULID NUMBER 954 95% TREAD ALWAYS GARAGED, . This is a regretful sale of my beautiful M3, It has been a fantastic car, Never let me down. I am the 3rd owner and have maintained it to the same high standard as the 2 previous owners, the service book is full of stamps, also contains receipts from its original purchase until now, all recalls documented etc. Cammed and super charged hsv Clubsport R8, 2006 build, 121532kms. Manual. Full leather 3 way electric sunroof Yellow speed height, rebound and damper adjustable coilovers (can raise and lower the car easily) Everything imaginable has new nolathane bushes and rubbers. 18" koya sf01 semi forged rims with nitto semi slick tyres. Warrnambool ads Warrnambool, All categories classifieds Warrnambool, All categories free ads Warrnambool, ads for sale Warrnambool, ads to buy Warrnambool, FREEADSAustralia Warrnambool Page number 2-1. Find here ads for sale, to buy and rent in Warrnambool. Goods for sale in Warrnambool, vehicles for sale in Warrnambool, Warrnambool real estate for sale, Warrnambool property for sale, property for rent in Warrnambool, business ads in Warrnambool, Warrnambool business classifieds, services in Warrnambool, Warrnambool services ads, jobs in Warrnambool, pets for sale in Warrnambool, Warrnambool dating, Warrnambool cars for sale.